We found 801 results matching your criteria. 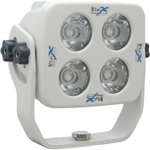 LED Lights are able to put out a higher amount of light than halogen lights. They also require very little power to work! These features make them ideal for tail and emergency light applications. An LED light holds a larger amount of metal, and thusly can handle a large current which in turn creates a large output of light! They even radiate only a small amount of heat in the form of infrared, but this can damage fabric or other sensitive objects.